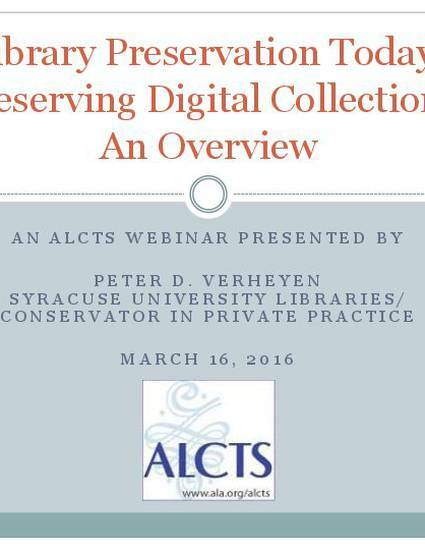 This presentation is an updated version of the one given in the Library Preservation Today! series in 2014. This introduction to digitization and digital preservation assumes ittle or no background in protecting and ensuring access to both born digital and digitized collections, including text, images, and AV collections. The presentation provides an overview of the issues, standards for digitization, metadata, organization, sustainability. It also provides links to resources and tools to begin extending the useful life of digital library collections. The recording is available from the ALA/ALCTS YouTube channel.